The second approach sits a bit more comfortably with me. All the analytical guff that gets layered on Scully’s work feels like a lot of unnecessary BS. He’s a blustery, no-nonsense painter, smashing out the abstraction without too much fuss. 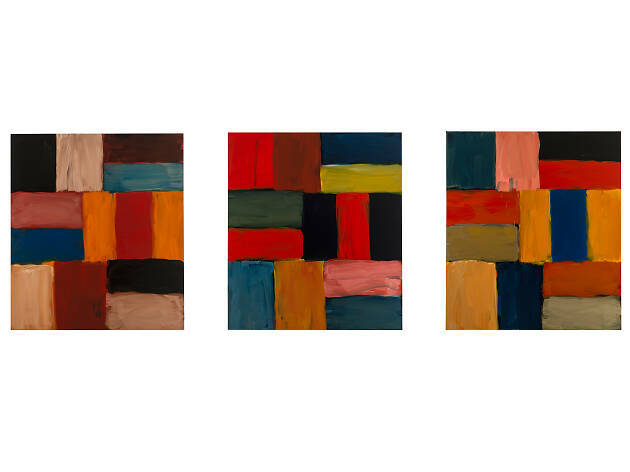 These are simple paintings of stripes, sometimes in a row, sometimes in a check pattern, sometimes intersecting. That’s it, and that fits him; the driven, successful, working-class boy from Highbury done good. Here, the National Gallery has gathered a free display of recent works, some responding to works in the gallery’s collection like Turner’s ‘The Evening Star’ and Van Gogh’s chair. Scully has a muted palette. Sombre ochres, drab English sky greys, barely-there light blues, bottomless blacks and dirty yellows. The best works are composed purely of horizontal stripes, like infinitely repeating horizons. Less good are the intersecting pieces, blocks of vertical mush on horizontal planes. He’s a real slip-slap-slopper, a messy ‘that’ll do’ painter. His work leaves me cold, and I struggle to feel much of anything about it all, but the rushed, slapdash quality of it has a charm. 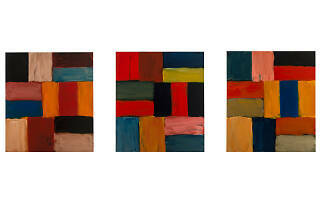 Really, these are just big bloody stripy paintings. If you’re into it, you’re into it, and no one’s going to change your mind if you find them tedious. Open daily 10am–6pm, Fridays 10am–9pm. Closed Jan 1, Dec 24–26.